Rice production has a major influence on Nepal’s economy and livelihood. It contributes to 7% of country’s GDP and 75% of working population is fully or partly engaged in rice cultivation. Most of the farmers have a weak economic condition with an average farm size of 0.72 hectares and an income of $1.28/day/person. Attempts have been made to improve their livelihood by increasing production, but mostly with little success. Increased production does not necessarily lead to increased income if farmers do not have access to a fair and free market. Moreover, rice cultivation is very susceptible to water stress and the problem will further exacerbate when the effects of climate change become even more pronounced. To increase the adaptive capacity of vulnerable rice farmers there is a need for i) an economical and easily applicable solution to improve yield ii) the development of rice value chain and iii) crop insurance to recover from catastrophic events. Crop insurance is at an early stage (<10 years) in Nepal and existing products are not appealing or accessible to most of the rice farmers. To ensure sustainability and effectiveness, the ClimateRe concept focuses on capacity building and institutional strengthening of cooperatives and development of their entrepreneurial competence. The activities are divided into three work packages (WP). The objective of WP 1 is to develop a climate toolbox that assists farmers to adapt to the inevitable consequences of climate change. In WP2 a customized value chain development strategy will be developed and implemented to improve farmer’s access to market and their bargaining power. For crop insurance (WP3) we propose a two-tiered scheme which is based on i) micro-level community managed insurance and ii) meso-level group insurance. Furthermore, rice is important for the food security and economy of the most part of Asia and other parts of the world (Figure 1) which makes the concept widely applicable. In many parts of the developing world, farmers occupy the base of socio-economic pyramid and agriculture is the main sectoral driver explaining higher poverty due to climate change (Hallegatte et al., 2016). Desktop research and a field study on the risk perception of the rice farmers carried out by ClimateRe in 2016 have shown that although the farmers are extremely vulnerable to extreme weather events and natural catastrophes they often perceive market risks, which traditional insurance (e.g. multiple-peril crop insurance) doesn’t address, as more severe. Moreover, these farmers have a long list of needs such as fertilizer agricultural tools or labour support (Figure 2) but only a limited liquidity. Fulfiling the needs are of higher priority than spending on insurance protection against few risks. Insurance often does not add value to a farmer’s livelihood unless their income can be enhanced through the availability of improved seeds and inputs, and functioning supply chains, and thus the crop insurance are not attractive to smallholder farmers (Worldbank, 2011). In Nepal, diverse social assistance programs exist for the promotion of agriculture (subsidies on fertilizer, seeds etc.) and to recover from large natural catastrophes (e.g. floods, severe droughts) (ILO, 2015a). Lack of holistic approach and bureaucratic barriers lower the impact of these programs on farmers food security and livelihood. For insurance, the prerequisites for the setup of crop insurance schemes are given by the Crop, Livestock and Poultry Insurance Directive (CLID 2013) and the Micro Insurance Directive (MID 2014), as well as there is a provision of 75% premium subsidy by the government. However, due to various regulatory barriers and the reluctance of insurers and farmers the insurance uptake is negligible. The total premium volume for total crop insurance was USD 83,000 in 2016 (Nepal insurance board, 2017). 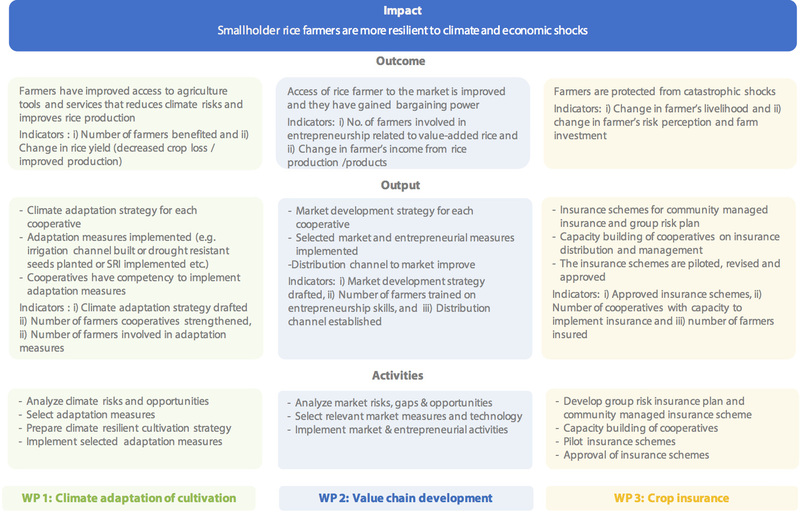 In addition to the reduction of climate and market risks, WP1 and WP2 address the needs of farmers. Our actions mainly focus on the capacity building and institutional strengthening of cooperatives on climate resilient cultivation and post-harvest value chain development. WP3 complements those measures and guarantees protection during catastrophic events. Collect and analyze data and information on the current climatic condition and future climate scenarios. Identify and describe sustainable and innovative adaptation measures, approaches or technologies for smallholder farmers and link adaptation measures to the risks & opportunities catalogue. Conduct workshops to support farmers to support them to prepare their climate adaptation strategy e.g. to prioritize short term and long term adaptation measures, prepare implementation plan etc. Implementation of 1 – 2 adaptation measures selected by the farmers. The implementation measures could be communal e.g. irrigation channel or individual e.g. water pumps. Cooperatives will receive technical and financial support (loan or subsidy) from NGOs and local agriculture development office to undertake the initiatives. Depending on the resources available implement other adaptation measures over time. Reduced crop loss and improved yield through improved access to knowledge, agriculture tools and inputs and other measures. Review and analyze the current market structure and farmer’s accessibility. E.g. market monopoly, access to a storage facility, production of value-added products etc. Analyze market trend, and supply and demands of rice and rice products e.g. organic, local, white or brown rice etc. Identify technology and measures to close market gaps and siege available opportunities e.g. rice mill, value-added products (rice flour, rice crackers), storage facilities, setting up delivery and distribution system, daily information on market price etc. Depending on the resources available implement other measures over time. The active involvement of farmers in strategy development and implementation creates ownership and responsibility feeling which increases the success of the program. Communal market measures (e.g. rice mill) provide an opportunity for cooperatives to convert in-kind contribution (labour and yield) by the farmers into cash. Rice farmers in Nepal are generally smallholders and subsistence farmers which are not of interest to insurance companies. Although farmers have shown interest in insurance, many of them lack the liquidity to pay premiums. Also, small land fragments and the low output value of rice makes it difficult for insurers to offer insurance cover to the interested farmers. Group risk insurance will help to overcome these obstacles. 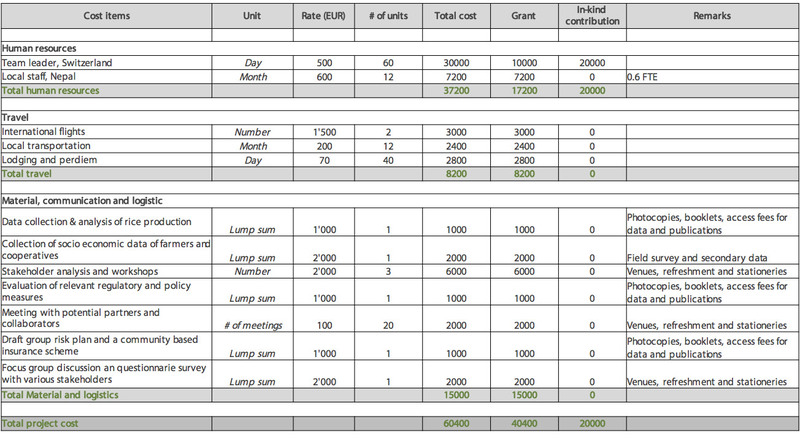 Example of a group risk plan: The scheme will cover production loss based on an average yield from the cooperative having app. 50 farmers. The cooperatives together with local agriculture office or NGO will be responsible for collecting data from each farmer which the insurance company will audit. The reference yield is derived from the historical data (5 – 10 Years) and not from a reference field. The historical data on rice yield are available from district agriculture development office. When the average yield falls below 80% of the reference value the payout is triggered, 20% is the deductible. This insurance scheme will be based on the group insurance plan that an insurance company can provide. The cooperatives who will be trained by external experts will distribute and manage the insurance portfolio. This insurance scheme lowers the administration costs and risks of moral hazard which makes it an attractive case for insurance companies. Example of a community managed insurance: The production loss is based on the average yield of the area and the rice variety. Low income farmers are allowed to pay the insurance premium in rice or labour (e.g. building irrigation channel - WP 1 or running rice mill - WP 2). The farmers are eligible for 75% government subsidy and thus most of the cooperative members will be able to join the program. When the average yield is below 80% of the reference yield, the payout is triggered. Equip the cooperatives with necessary tools e.g. computer, ledger books etc. Carry out necessary lobbying to make the schemes eligible for the government agriculture insurance subsidy program. The group risk plan will reduce the administration cost of the insurance companies, reduces moral hazard, reduces the risk of an inability of premium payment etc. The proposed insurance is based on yield output and not in agriculture input; compared to bundled insurance (e.g. seed, fertilizers) the farmers will receive larger risk coverage. The cooperatives will undertake monitoring and evaluation of the WP under external supervision and guidance, which will be used to periodically revise the WP and to assess the impact of the project. A complete monitoring plan and evaluation framework will be developed based on the outputs and outcomes from each WP. The expected outputs, outcomes and impact and their indicators are given in figure 5. Farmer cooperatives: They play a central role in ClimateRe concept. In Nepal, agriculture micro-insurances are mainly managed in an informal manner via cooperatives. In our case, it will be formalized and they will manage community based insurance scheme. The cooperatives will also own climate resilience strategy and value chain development plan and will be responsible for implementing and managing them. Farmers: Smallholder rice farmers are the targeted beneficiaries of the project. The farmers are directly involved in operation and maintenance of climate risk measures (e.g. building and maintaining irrigation channel, training other farmers etc. ), and operation and maintenance of market measures (e.g. running rice or flour mills, packaging of rice etc.). Insurance companies: Insurance companies are the commercial insurance providers who are already providing non-life insurance. The insurance company will work with cooperatives to develop a group risk insurance scheme. They will provide a payout based on the aggregated yield loss and will also oversee the data and bookkeeping of cooperatives. NGOs and other development organizations: These are the organizations who have strong technical knowledge and experiences on climate resilience and/or value chain development. These organizations will provide training, technical support and guidance to cooperatives for the development of climate resilience rice cultivation strategy and value chain development. District agriculture development office, Nepal: Department of Agriculture bears overall responsibility for the agricultural growth and the development of agriculture sector. The government’s local agriculture office will collaborate and facilitate the project implementation. Nepal insurance board: Insurance Board is a regulatory agency which has the mandate to systemize, regulate, develop and regulate insurance business. The developed insurance products have to be approved by insurance board. In Nepal, the economy is dominated by agriculture, providing employment to around two-thirds of the economically active population and contributing one-third to the gross domestic product. Rice has been the most important crop in Nepal accounting for about 50 percent of the total agricultural area and production in the country. As per the statistical information on Nepalese agriculture, average paddy cultivation area is around 1.42 million hectares (ha) with a total production of around 4.8 million tons (MoAD, 2016). Nepalese rice farmers bear the adverse effects of climate change in forms of erratic monsoon rainfalls resulting in the decline in rice yield which is already much lower (3 tons/ha) than neighbouring countries. The pilot project will be in the Biratnager district, East Nepal. Funded by Climate-KIC Europe, in fall 2016 ClimateRe already carried out a scoping study on crop insurance in rice cultivation and build up the capacity on System of Rice Intensification (SRI) of extension workers in collaboration with the Regional Agriculture Directorate. A participatory approach is a central theme of all project activities, as every farmer will be leading her/his own agriculture adaptation and value chain development strategy (WP1/WP2). Furthermore, cooperatives play a central role in designing and implementation of two-tiered crop insurance scheme (WP3). We will also ensure that the project will subjectively promote the inclusion of marginalized groups of the community. In every step of the project, 50% participation will be reserved for marginalized and disadvantaged groups - Dalits (lower caste), women and moyhis (tenant farmer). The sustainable use and management of soils, watersheds and water bodies are integral parts of sustainable rice cultivation. Thus, conservation of those natural systems and their ecosystem services will be promoted using the toolbox in WP1 and improved rice cultivation will limit the overexploitation and lead to a healthy relationship with the ecosystem. Focus ground discussion and workshop to get feedback on insurance schemes developed. From year two onwards activities of WP1 (Climate resilient rice cultivation) and WP2 (Rice value chain development) will happen parallel. After four years the value chain of 10 cooperatives (equivalent to 1000 farmers) will be developed an adapted to climate Change. From year five onwards scaling-up of WP1/2 starts. WP3 (Two-tier crop insurance) starts in year two with development of the group risk insurance followed by the community based insurance Pilot of insurance product on selected cooperatives start in year five following by the scaling-up from year seven onwards. AFC (2014) Market Assessment for Agriculture Insurance in Nepal. Bonn: AFC Consultants International GmbH. 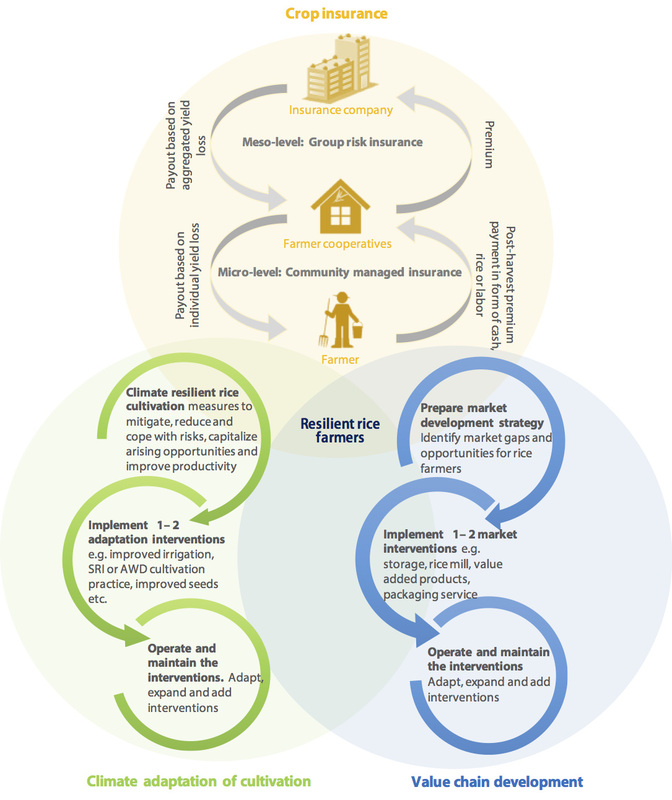 ECA working group (2009) Shaping climate-resilient development: A framework for decision-making, a Report of the Economics of Climate Adaptation (ECA) Working Group. Retrieved on March 31, 2015. http://media.swissre.com/documents/rethinking_shaping_climate_resilent_development_en.pdf. Hallegatte, S., Bangalore, M, Bonzanigo, L., Fay, M., Kane, T., Narloch, u., Rozenberg, J., Treguer, D. & Vogt-Schilb, A. (2016) Shock Waves: Managing the Impacts of Climate Change on Poverty. Climate Change and Development, Washington, DC: World Bank. IFAD (2011) Weather Index-based Insurance in Agriculture Development - A Technical Guide. Rome: International Fund for Agricultural Development. Khanal, D. (2013) Social Security/Social Protection in Nepal: Situation Analysis. ILO country office for Nepal. Krishnamurthy, P. K., Hobbs, C., Matthiasen, A., Hollema, S. R., Choularton, R. J., Pahari, K., & Kawabata, M. (2013) Climate risk and food security in Nepal—analysis of climate impacts on food security and livelihoods. CCAFS Working Paper no. 48. Mahul, O. & Stutley, C.J. 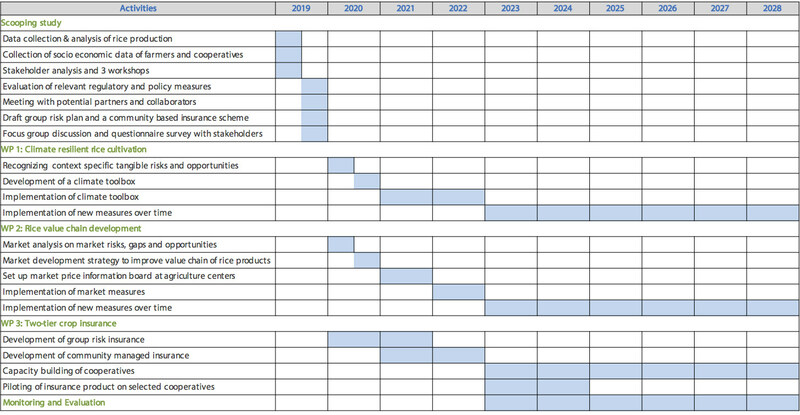 (2010) Government Support to Agricultural Insurance: Challenges and Options for Developing Countries. World Bank. MoAD (2016) Statistical Information in Nepalese Agriculture 2014/2015. Kathmandu: Ministry of Agriculture Development, Government of Nepal. Nelson, G.C., Rosegrant, M.W., Koo, J., Robertson, R., Sulser, T., Zhu, T., Ringler, C., Msangi, S., Palazzo, A., Batka, M., Magalhaes, M., Valmonte-Santos, R., Ewing, M. & Lee, D. (2009) Climate Change: Impact on Agriculture and Costs of Adaptation, International Food Policy Research Institute (IFPRI). Van Wingerden, L.A. & Brouwer J.H. (2014) Is the time right for agricultural microinsurance in Cambodia? A scoping study for Achmea. Practice brief. Centre for Development Innovation, Wageningen UR (University & Research centre), Wageningen. World Bank. (2009) Agriculture Insurance Feasibility Study of Nepal. South Asia: The World Bank. World Bank (2011) Weather index insurance for agriculture: guidance for development practitioners (English). Agriculture and rural development discussion paper; no. 50. Washington, DC: World Bank.